KBS LTER REU Rachel Geiger collecting flocculent material (floc) in Augusta Creek to test for carbon content. This summer I set out with a goal to discover what it means to conduct ecological research. Throughout my undergraduate career I have always been drawn to science labs, finding that I enjoy the hands-on learning process, and the feeling of leaving at the end of the day with prominent goggle lines on my face and an itch to tell someone what I did. Despite taking as many lab classes as I could mentally handle, I had never conducted research due to the limited opportunities available for environmental science majors at my college. 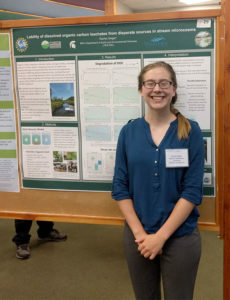 I sought out Research Experiences for Undergraduates (REU) programs across the country for two years until I was accepted to the Kellogg Biological Station Long-term Ecological Research (KBS LTER) REU program at Michigan State University. This is where my journey began. 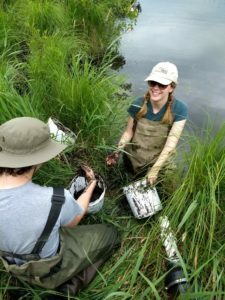 I worked in Dr. Jay Zarnetske’s Watershed Science and Hydroecology Lab this summer at MSU’s main campus, and I developed an arsenal of resources that I can use to interact with the scientific community. My main project was to determine how different sources of carbon were processed within the stream and stream subsurface environment. Imagine rows of amber glass bottles containing slurries of sediment, stream water, and “leaf juice” stretching across the length of the lab bench. These simulated stream jars allowed us to collect over 400 samples from which we were able to build a picture about what the carbon was doing as it interacted with the system. Modeling natural systems in the lab is an important part of ecological research because it is a way to test if the environment will respond how you expect it to. Breaking down landscape-wide phenomena into manageable, testable processes is no easy task. I had spent hours reading previous studies on how scientists approach these biogeochemical processes differently, and I learned there are many different lenses that a person can view ecology through. KBS LTER REU Rachel Geiger presents her research at the KBS Undergraduate Symposium. In the MSU campus lab I was viewing my work through a chemistry perspective as I analyzed the carbon concentrations of the water samples on fancy machines. In the field, I saw the world as an environmental scientist; as we waded through Augusta Creek collecting samples and measurements from the stream, the bigger picture of my research came into view around me. Presenting my research at the KBS Undergraduate Symposium challenged me to communicate my research with a broad audience, revealing to me the importance of science communication and outreach. Performing ecological research requires the ability to make connections with many fields of science in order to better understand the processes at play. In my experience, it required strong attention to detail while crafting and conducting an experiment, as well as the ability to draw upon many areas of study in order to draw conclusions about the environment. One of the most powerful messages from this summer was that scientists rarely work alone. Whether the voices are coming from a methods section of a published study, from your advisor, or from the other scientist in your lab, there is a community out there working toward the common goal of scientific advancement. I am consistently inspired by the enthusiasm of my peers as they seek to discover something new or understand a process better. As I finish out my final year as an undergraduate, I now have a better understanding of what being an ecological researcher in graduate school entails.